Lock in a great price for La Boutique Puerta Osario – rated 8.8 by recent guests! 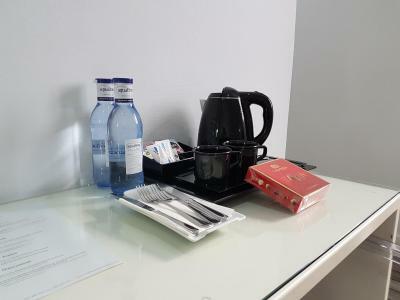 The hotel was in an excellent location, within easy walking distance to main attractions. Staff very friendly and helpful. Room was very clean. Great position, close to all the city's amenities, a few good restaurants and only 15 minutes walk from Cordoba's train station. Our room was clean, it had a small fridge and a really nice bathroom. The room was nice and had modern decor. The gentleman at the reception was very nice and helpful in providing lots of good information. The bed was large since we had booked a triple and was pretty comfortable. 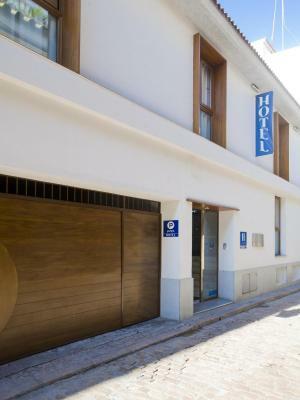 Fabulous boutique hotel in the historic district of Córdoba! David was an expert at helping us park our rather large vehicle in their garage which was a relief. We also appreciated his advice. We were very happy and comfortable. We highly recommend this hotel! The front desk staff (Pedro) very professional! The lady that served breakfast was very diligent and pleasant. Hotel is in the center of the city. Walking distance from the historic center. The room is a bit small but ok. The ‎furniture was new and beautiful. The staff was very nice and friendly with us. The breakfast is not a buffet but the food is good and the waitress was very kind. So clean and fresh. Bright and cheery. Very modern decor and amenities. La Boutique Puerta Osario This rating is a reflection of how the property compares to the industry standard when it comes to price, facilities and services available. It's based on a self-evaluation by the property. Use this rating to help choose your stay! One of our top picks in Córdoba.This boutique hotel is next to Puerta Osario, one of the ancient gates of Córdoba’s Roman Wall, and is a 15-minute walk from the Mezquita. Each air-conditioned room offers free Wi-Fi. Rooms at Hotel La Boutique Puerta Osario have wooden floors and heating. They also feature a mini-bar and a work desk. 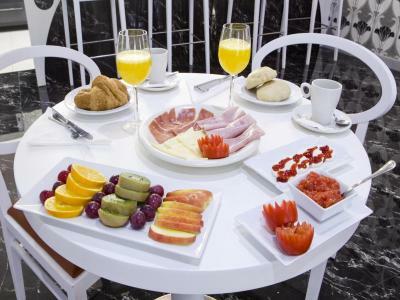 The Puerta Osario has a café-bar, and room service is available. The hotel is within a short walk of shops, bars and restaurants. The Puerta Osario is located in Córdoba’s Jewish Quarter and around 650 feet from San Miguel Church. Córdoba Railway Station is just over 0.6 mi from the hotel and the Airport is a 20-minute drive away. When would you like to stay at La Boutique Puerta Osario? Air-conditioned room with flat-screen satellite TV, minibar, safe and work desk. The private bathroom comes with a hairdryer and toiletries. Private parking is available on site (reservation is needed) and costs EUR 15.40 per day. Smaller air-conditioned room with a double bed, flat-screen satellite TV, mini-bar and work desk. The private bathroom comes with a hairdryer and toiletries. Extra beds or cots are not allowed in this room type. La Boutique Puerta Osario is located in the historic and commercial center of Cordoba, so its location allows for enjoying at few meters from shops, taverns and restaurants and around fifteen minutes from the main monuments. House Rules La Boutique Puerta Osario takes special requests – add in the next step! La Boutique Puerta Osario accepts these cards and reserves the right to temporarily hold an amount prior to arrival. Rooms felt a little claustrophobic as no windows but obviously that can’t be helped ! Location was good staff vey friendly & helpful. Very clean excellent breakfast . The car park was very small and tricky to enter and exit due to the very narrow road the hotel is situated on. Mattresses were a bit too soft (I slept really comfortably but my partner, who suffers from back problems, was quite stiff in the morning). The walls in the shower were white, but you could tell towards the bottom that they hadn't been cleaned as thoroughly as I would have liked. It was a bit of a walk to the Mezquita and bridge, which is towards the historic center. Friendly helpful staff. They had good suggestions for things to do, places to eat, taught words in Spanish. Room comfortable, clean, well looked after. Super location to walk eveywhere in old city. Highly recommend this hotel. Lack of sound proofing in rooms. Could clearly hear snoring next door! Google maps led v narrow route to hotel. Need a small car! Bottom sheets too small for beds, which were very spacious. This meant the sheet rucked up during the night causing discomfort. Everything else was excellent. Spotlessly clean and comfortable room. Excellent breakfast. Very good location. The NOISY lifts next to our room, keeping us up 'til late, and then waking us up early in the morning! Very friendly staff. Nice breakfast.